Sturdier than typical bras, these minimise chest movement, alleviate discomfort, and reduce potential damage to chest ligaments, so that your daily fitness routines and mid-to-high impact workouts aren’t affected. Browse online today with Sun & Sand Sports and get the latest in sports bras. Many women wear sports bras to reduce pain, and physical discomfort caused by chest movement during exercise. Some sports bras are designed to be worn as outerwear during exercise such as jogging. The original sports bra that was made commercially available in 1975 was the “Free Swing Tennis Bra” introduced by Glamorise Foundations. 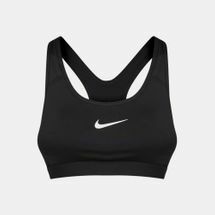 The first general exercise bra, initially called a ""jockbra"", was invented in 1977 by Lisa Lindahl after her sister complained about her bad experience exercising in ordinary bras that caused chafing and having runaway straps. The most common sports bra is basically designed like a tank top with the bottom half cut off. Other designs use gel and water pads, silver fibres, and air bags. These sports bras can either encapsulate or compress the chest. These bras are generally more effective at reducing discomfort so that you are tension-free when working out. So get yourself a sports bra with Sun & Sand Sports online and have it delivered to your doorstep in Riyadh, Jeddah and anywhere else in KSA.